When is the next Glendalough Trail Event? The Long Course will be 15.5km long and the Short Course event will be a 8.6km route for joggers / walkers. The route is totally free of traffic and mainly on good quality forest trails. In the Long Course (15.5km) route there is approximately 800m of very mucky trail with lots of fallen tree branches to cross. Trail shoes are recommended particularly for the Long Course (15.5km) event. Your shoes will get wet and mucky in the longer event but should not in the short course event unless you splash in puddles. The Long Course (15.5km) race will start at 11am for all runners and most joggers. The Race Director reserves the right to limit access to the 10.30am start to those they deem suitable to avoid results confusion! Please carpool as space is limited. 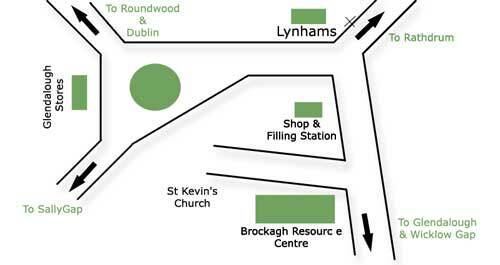 Please allow 10 minutes to walk to the Brockagh Centre from here. How do I enter the Glendalough Trail event? What happens when I enter online? Your card details will be processed & debited for the entry fee and you will receive an e-mail detailing your receipt number. Total minimum cost to participate is therefore €65, €70 or €75 depending on when you enter. The Glendalough Trail is an annual fundraising event for Fighting Blindness. By submitting an entry for the event, all participants are agreeing to raise or donate a further €50 minimum towards the work of Fighting Blindness. When is race sign on? On the day of the event all participants must sign on and collect their race number from the Brockagh Resource Centre in Laragh Village, just uphill from McCoys shop/petrol pumps - Brockagh Centre location map here. All participants must have entered the race online prior to midnight on Wednesday Oct 16th unless race limit* reached in advance. There will be no late or entry available on the day of the event. Race sign on will be from 9am to 10.30am in the Brockagh Resource Centre. Tea and coffee is available for all participants at the registration point as shown on the map below. Will I be given instructions prior to the race? Race briefing will take place prior to the event and participants will be given instructions about the race. Race briefing for slow joggers and visually impaired athletes in the Long Course (15.5km) event will take place in the Brockagh Centre at 10.10am. These participants will then be transferred to the race start location for a 10.30am start by our courtesy bus. Participants can walk/jog to the Glendalough Hotel from the Brockagh Centre (~1km). There will be a limited capacity courtesy bus service from the Brockagh Centre to the Glendalough Hotel car park - Please jog or walk to the start area where possible thanks. The route will be clearly marked with yellow arrows & red & white tape at all junctions which should be strictly followed. Are there any water stations along the race route? Water is provided in cups at these points and all cups must be disposed of at these water stations in bins provided. Is there a race cut off time? Yes - The full course will officially close at 1.30pm. Race signage and marshals will be removed in accordance with this schedule. A baggage and key drop area will be available in the Brockagh Resource Centre, beside the registration desk. Items left in this area will be labelled with your race number. The race organisers will not accept responsibility for items of value left in this area. Please ensure your race number is attached on Front Outer Clothing as the timing chip is incorporated into the race number. We aim to process results as soon as possible after race finish and publish provisional results on day of race on this website. The race will finish on the "Green Road" close to the pedestrian bridge near the OPW visitors centre. Are refreshments provided after the race? Fruit and water will be provided at the finish line. Tea, coffee and light refreshments will be available in the Brockagh Resource Centre for all participants after the race. Are there prizes for the race winners? In the 15.5km event prizes will be given for the first three and first over 40 (Outside the top 3) male and female finishers. The 8.6km event is designed as a non-competitive event to be enjoyed and no prizes will be awarded. Will I receive a race tee shirt or goody bag? A Glendalough Trail running t-shirt will be available for all participants at registration on the day of the event. In order to minimise entry fees for participants, and lower costs for Fighting Blindness, goody bags will not be provided. Do I get a refund or deferment if I am unable to attend? Unfortunately we are unable to provide a refund or deferment if you are unable to take part. Can I transfer my number if I can't run? We will take entry transfers (one name change per entry) and change of distance requests FOC prior to October 1st.